I want to thank the commenters who have reacted to my previous articles, providing many useful insights and bits of information. This is the kind of reactive, collaborative, or even “crowd-sourced” discovery of history which was indeed impossible before the blessed age of the Internet. 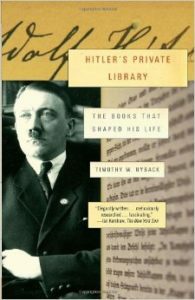 I am prompted to write this article by Timothy Ryback’s book Hitler’s Private Library. It uses as its source material some of the 1,200 of Hitler’s books that have survived (less than 10% of the original total) and which are stored in the Library of Congress (one wonders if and when such stolen historical artifacts will be returned to their rightful owners in Germany). The book has plenty of useful information, as we shall see. But the author does not really intellectually engage with the admittedly voluminous material or provide any interpretation by which it might hang together. Perhaps that is for the best. This suggests however that a comprehensive history of Hitler’s intellectual (self-)education – especially as regards to books – has apparently yet to be done. 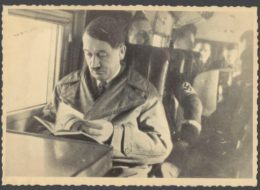 This is a question worth answering: What did Hitler read? Evidently this is a promising avenue for a talented, independent-minded German-speaking historian (which, leider, I am not). Nonetheless, why shouldn’t we work together here and now, and establish some promising pistes? The latter quote and nightly readings are reported in Leni Riefenstahl’s memoirs. Other accounts are entirely congruent with this. Hitler’s childhood friend August Kubizek wrote: “Books, always more books! I can never remember Adolf without books. Books were his world” (137). These were read not for idle pleasure but proactively as “deadly serious business” of self-education and intellectual development. The other friend of his youth, Rudolf Häusler, similarly said that Hitler would read large tomes until two or three in the morning. 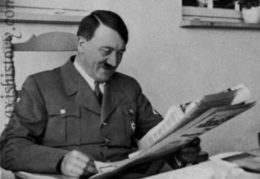 Hitler read a great deal, usually late at night after he had retired and was unable to fall asleep. His personal reading consisted of technological matters, biographies of all sorts, and studies of his favorite arts: architecture, painting, sculpture, music, the theater, and the cinema. But he ignored on principle theoretical or belletristic works. He had a special antipathy for novels, which he never read, and for poetry; poems were an abomination to him. Housekeeper Margarete Mitlstrasser and Berghof manager Herbert Döhring would find Hitler reading until dawn. Eva Braun was once sent back in tears after interrupting Hitler and a sign would be hung on his door with the notice: “ABSOLUTE SILENCE” (138). Secretaries Traudl Junge and Christa Schröder recalled that Hitler would discuss his recent readings in detail. Schröder explained that this was “in order to anchor it more permanently in his mind” (138). So determined was Hitler in his habits that Junge reported that in April 1945, in the depths of despair in the Führerbunker, she would still find a bespectacled Hitler sitting in his armchair in the evening, reading (235). All through the day, from noon to past midnight, Hitler insisted on having the latest foreign broadcasts and the most recent items from the foreign press. These reports were delivered in writing to his personal servant, who always remained close by him and kept them ready at hand for him. In the morning they had to be at his bedroom door, in case Hitler awoke early. There has probably never been a head of government who was so swiftly and completely informed on public opinion throughout the world as Hitler. Hitler disliked the press however, citing for example its blindness to contemporary geniuses, a criticism Schopenhauer also often made. And I now began to examine my beloved “world press” from this [Judeo-critical] point of view. And the deeper I probed, the more the object of my former admiration shriveled. The style became more and more unbearable; I could not help rejecting the content as inwardly shallow and banal; the objectivity of exposition now seemed to me more akin to lies than honest truth; and the writers were – Jews. I now saw the liberal attitude of this press in a different light; the lofty tone in which it answered attacks and its method of killing them with silence now revealed itself to me as a trick as clever as it was treacherous; the transfigured raptures of the theatrical critics were always directed at Jewish writers, and their disapproval never struck anyone but Germans. The gentle pin-pricks against Wilhelm II revealed its methods by their persistency, and so did its commendation of French culture and civilization. The trashy content of the short story now appeared to me as outright indecency, and in the language I detected the accents of a foreign people; the sense of the whole thing was so obviously hostile to Germanism that this could only have been intentional. 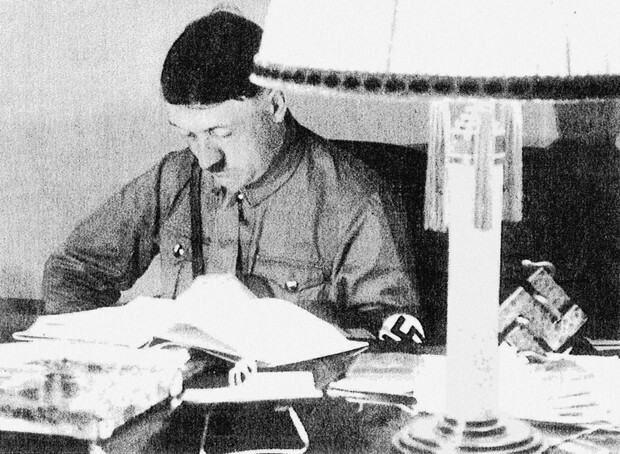 We cannot give a comprehensive account of Hitler’s most important and favorite books, but we have some indications. Apparently he did not dislike all novels, considering Don Quixote, Robinson Crusoe, Uncle Tom’s Cabin [sic], and Gulliver’s Travels to be works of genius (Table Talk, February 17, 1942). He considered Shakespeare far superior to Goethe and Schiller, and loved to quote Hamlet and Julius Caesar. While hating Christian superstition and slave-morality, he apparently knew his Bible well. Hitler claimed his own experience was described perfectly in fellow founding National Socialist Anton Drexler’s My Political Awakening. Dietrich Eckart, whom Hitler called the “polar star” of the Party, gave him a copy of Ibsen’s Nordic tale, Peer Gynt, which Eckart had also translated. He read Gottfried Feder’s Manifesto for the Abolition of Interest Slavery. 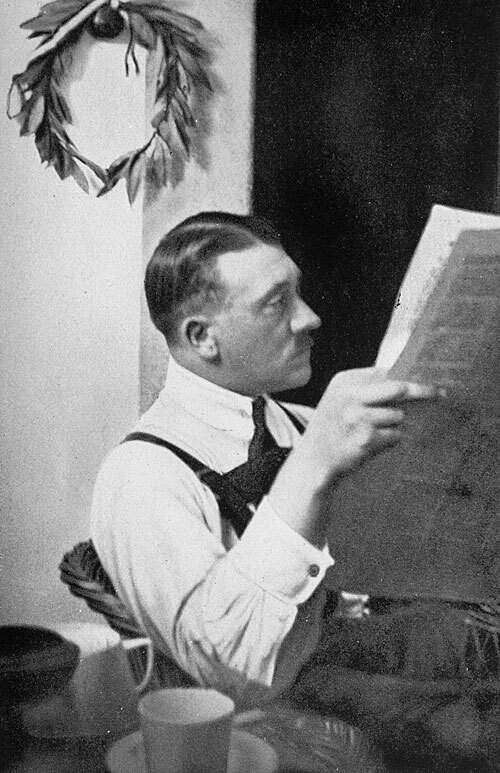 It is unclear whether Hitler read Arthur Moeller van den Bruck’s The Third Reich. Hitler took advantage of his time at Landsberg Prison to undertake what he called “higher education at state expense” (67). He read (not necessarily while there) Hans Günther’s Racial Typology of the German People, Houston Stewart Chamberlain’s Foundations of the Nineteenth Century (he later met the author), and various works on the innumerable anti-Jewish critiques of the great Western minds (Luther, Goethe, Schopenhauer, Zola . . .). Hitler read Paul Lagarde’s German Essays and underlined anti-Semitic passages advocating their physical removal as a “solution,” including one sentence: “Jews will be Jews” (140). 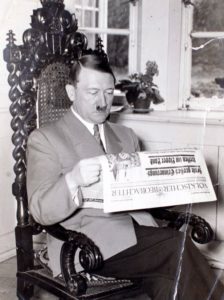 Hitler famously read Henry Ford’s The International Jew: The World’s Foremost Problem. In 1922, Hitler’s private office featured a picture of Ford and the young nationalist leader would state “I regard Ford as my inspiration” (71). Like Ford, Hitler considered The Protocols of the Elders of Zion to be an accurate portrayal of Jewish behavior, whether or not the malicious motives were conscious or whether the document was authentic. Hitler described Madison Grant’s The Passing of the Great Race as his “bible” in a letter to the author. One can certainly see the influence on Hitler’s thinking, namely the haunting observation that the innumerable victories of the old Nordic and Germanic tribes were vain insofar as the conquerors blended with the natives. Grant draws unsentimental, eugenic, anti-democratic, segregationist, and potentially exterminationist conclusions. Grant was more pan-European than Hitler, noting that both France and Germany were not exclusively Nordic (southern Germany in particular was largely Alpine . . .) and that “from the race point of view, the present European conflict [the First World War] is essentially a civil war” (101). Hitler certainly appreciated a certain Aryan America. Hitler did not like Alfred Rosenberg’s Myth of the Twentieth Century, besides the trouble the book caused with the churches. SS chief Heinrich Himmler gave Hitler The Voice of the Ancestors and Death and Immortality in the World View of the Indo-Germanic Thinkers as birthday presents. Hitler apparently read Sven Hedin’s 200-page America in the Battle of the Continents in a single night in October 1942, or so he appreciatively wrote to the author in any case (208). Hitler was passionate about history from a young age – this being the only school class he enjoyed. As a youth he read his father’s copy of Heinrich Gerling’s history of the Franco-Prussian war. 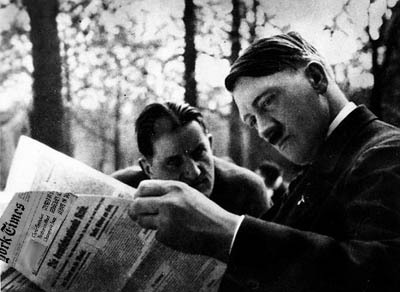 In 1922, Hitler would constantly buy books in Munich, such as those dealing with Austrian and French military history. I do not know from which books Hitler learned about his unerring historical models: The Greco-Roman world (especially racialist and militarist Sparta), the Holy Roman Empire of the German Nation (or the “First Reich”), and Brandenburg-Prussia. This strikes me as a very important question. From the Greeks, Hitler took the notions of racial citizenship, eugenics, and authoritarianism. He called Sparta “the first Volksstaat.” Personalities as different as Otto Dietrich and Karl Popper have noted the ideological filiation between Plato’s philosophy and National Socialism (Plato’s authoritarian leanings in The Republic only went further with his final work, The Laws, taking Sparta as a model). Hitler cited Thomas Carlyle on occasion, including during his 1923 trial and in some speeches. Carlyle had written On Heroes, Hero-Worship, and the Heroic in History and an incredibly-long 21-volume history of Frederick the Great. Hitler was perhaps only slightly less infatuated with the Prussian king, frequently citing him as a model of austere militarism, enlightened despotism, and, above all, indomitable will and providential fortune. Up to the end, Hitler would evoke Frederick to rouse the German people to resistance, hoping against hope that Germany would be saved by luck, as Prussia had been by the death of the Russian Empress Elizabeth during the Seven Years War. Hitler would similarly cite Clausewitz to the same effect, less in reference to his famous treatise On War (whose influence on Hitler is unclear to me), but to his call to continue the resist Napoleonic France no matter the immediate military defeats. Revolutionary and Napoleonic France clearly had a certain influence on Hitler, if only by a kind of mimetic dialectic. Hitler faulted Napoleon for declaring himself Emperor (Consul should have sufficed, apparently as Führer did for Hitler). The Republican/Napoleonic project of welding a communauté nationale – even without the racial element, which in fact was sometimes present (e.g. Sieyès) – in the name of social unity and patriotism, in some ways recalls the Hitlerian Volksgemeinschaft. Hitler read Bismarck’s memoirs, commenting: “I know of no more trenchant criticism of the Kaiser than that given in the third volume of Bismarck’s own memoirs” (Table Talk, August 20, 1942). Hitler considered the Iron Chancellor as a model and a hero as the unifier of Germany, but lamented that he had been powerless against the rise of nihilism. He met with Bismarck’s descendants. There was hardly a book on architecture that Hitler had not read, and he took the keenest interest in all new publications. 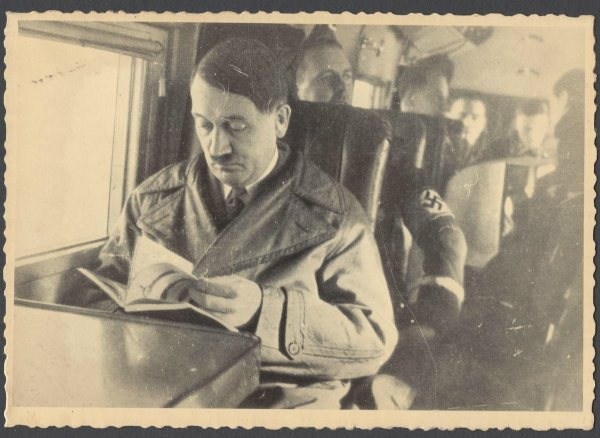 When asked by Leni Riefenstahl what he liked to read, Hitler answered simply: “Schopenhauer.” When asked on Nietzsche, he responded: “I can’t really do much with Nietzsche” (129). Nonetheless, he would meet with Nietzsche’s relatives. Hitler gave a deluxe edition of Nietzsche’s collected works to Mussolini on the latter’s sixtieth birthday. Mussolini was almost invariably a dear friend of Hitler’s and, like Richard Wagner, must be considered one of the great non-literary influences on him. Presumably Hitler read Wagner’s Jewry in Music. Heroic classical music was like a drug for the young Hitler. One has the impression that his political career was an unceasing effort to communicate this same exalted feeling of living an epic saga, in service to his fanatical reason and an awesome national destiny, to an entire people. Hitler was a close friend of the Wagner family. I suppose a doctoral thesis could be written on Schopenhauer’s influence on Hitler . Lance Corporal Hitler famously carried about Schopenhauer’s enormous books in the trenches with him during the First World War. I tend to think that both the experience of the war and the example of Schopenhauer’s genius – one really has to read such an uncompromising and witty exposition of the unpopular facts of human life – had an enormous impact on Hitler. The two no doubt gave him, the impoverished artist who had barely escaped the humiliation of bumhood, an enormous boost in self-confidence (the passages in Mein Kampf on underemployed youth lacking self-esteem surely continue to resonate with many “NEETs” today). I know rather less on the possible influence of Luther, Kant, Hegel, Spengler, Schmitt, and others. Many of their ideas are obviously present in Hitler, whether he was directly influenced or via these ideas’ influence in German society as a whole (e.g. anti-Semitism, authority . . .). But Ryback notes in passing that there is no guarantee the marginalia are Hitler’s . . .
1. I note that the “Nazi art thieves” theme continues to be unerringly popular in Hollywood. 2. There are also some odd statements which strike me as mistakes, e.g. : referring to Hitler’s “militant Prussian chauvinism” and listing Schopenhauer among “nineteenth-century German nationalists” (126-7). In consequence of his originality, it is true of him in the highest degree, as indeed of all genuine philosophers, that only from their own works does one come to know them, not from the accounts of others. For the thoughts of those extraordinary minds cannot stand filtration through an ordinary head. Born behind the broad, high, finally arched brows from under which beaming eyes shine forth, they lose all power and life, and no longer appear like themselves, when moved into the narrow lodging and low roofing of the confined, contracted, and thick-walled skulls from which peer out dull glances directed to personal ends. In fact, it can be said that heads of this sort act like an uneven mirror in which everything is twisted and distorted, loses the symmetry of its beauty, and represents a caricature. Only from their creators themselves can we receive philosophical thoughts. Therefore the man who feels himself drawn to philosophy must himself seek out its immortal teachers in the quiet sanctuary of their works. The principal chapters of any one of these genuine philosophers will furnish a hundred times more insight into their doctrines than the cumbersome and distorted accounts of them produced by commonplace minds that are still for the most part entangled in the fashionable philosophy of the time, or in their own pet opinions. But it is astonishing how decidedly the public prefers to grasp at those descriptions at second-hand. In fact, an elective affinity seems to be at work here by virtue of which the common nature is drawn to its like, and accordingly will prefer to hear from one of its own kind even what a great mind has said. Perhaps this depends on the same principle as the system of mutual instruction according to which children learn best from other children. Arthur Schopenhauer, The World as Will and Representation (New York: Dover, 1969), volume 1, preface to the second edition (1844), xxv. Hitler was certainly more artist than philosopher, but the point stands. 4. Otto Dietrich, The Hitler I Knew: Memoirs of the Third Reich’s Press Chief (New York: Skyhorse, 2010), 8, 123. Dietrich’s memoirs, written in 1949, are embittered and repentant, with clear denunciations of Hitler literally as a kind of demonic false prophet who had demanded all from his subordinates and Germany, only to bring about complete disaster. They are concise, highly readable, and informative. It is almost cliché [sic] to say that the Viennese liberal press was very Jewish. The problem with antisemitic attacks on the ‘Jewish press’ was that, in Vienna at least, there were based on hard fact. All the major daily newspapers of the liberal press were either owned or edited by people of Jewish descent. There were Bacher and Benedikt at the Neue Freie Presse, regarded by many as The Times of central Europe. This paper had a circulation rival in the Neue Wiener Tagblatt, whose founder and chief editor was Moritz Szeps. When Szeps left to start the rival Wiener Tagblatt in 1886, after a dispute with the board, the Singer brothers took it over. Then there was the Wiener Allgemeine Zeitung, edited by Theodor Hertzka, and later by Szeps’ son, Julius. The socialist newspaper, the Arbeiter Zeitung, was edited by Friedrich Austerlitz. All these figures, the central actors in the history of the Viennese liberal press, were of Jewish descent. This by no means exhausts the list of newspapers run by Jews. Even newspapers which were conservative in profile, clerical or antisemitic, could be staffed by Jews. [. . .] Tietze [a historian] gives the example of the Neue Wiener Journal, but his was not the only case. The history of Jewish journalism and of the Viennese press in general, it has been said, almost amount to the same thing. Especially noteworthy is the fact that the three main cultural journals of the turn of the century were run primarily by Jews: Die Zeit by Heinrich Kanner and Isidor Singer, along with Hermann Bahr (not of Jewish descent), Die Wager, edited by Rudolf Lothar, and Die Fackel, by Karl Kraus. At the editorial level of the liberal press the Jewish presence was dominant. The leaves the question of the Jewish presence in the lower ranks, in the main body of journalists. The Festschrift of the journalists’ and writers’ society in Vienna, Concordia, contains a list of all the members of the society [. . .]. At present the proven figure for the Jewish presence, out of a total membership of 359, is 185, 51.5 per cent. If then [. . .] we count in half of those names regarded by Dr Heuer and Dr Jäger-Sunstenau as probably Jewish, then the total goes up to 227, 63.2 per cent. Steven Beller, Vienna and the Jews, 1867-1938: A Cultural History (Cambridge: Cambridge University Press, 1989), 38-40. Beller rationalizes his account by adding that Jews were so staggeringly over-represented in the Viennese media because this was one of the few professions without religious restrictions. Of course, Jews also have historically “prospered” in the mass media of other countries such as the United States, Germany, France, or Great Britain, even when there were no such religious restrictions. 9. Dietrich, The Hitler I Knew, 123. 10. Ibid. Presumably especially Man and Superman. 12. Hitler was incidentally most impressed by the conversations between Frederick and Voltaire (I am not sure if he was referring to the two’s written correspondence, which is incredibly obsequious). 13. Dietrich, The Hitler I Knew, 61-62, 132.